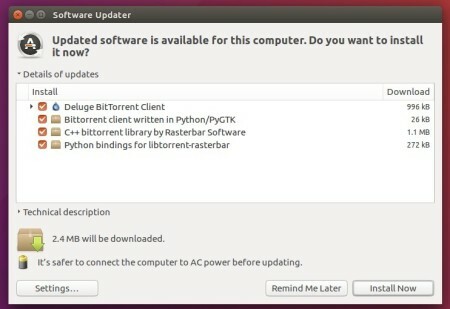 The Deluge BitTorrent client 1.3.14 was release one day ago. Users with previous release installed are highly recommended to upgrade to this release. For WebUI, Deluge 1.3.14 contains a fix for CSRF vulnerability that has the real potential to compromise your machine. For Windows user, the package now includes libtorrent 1.0.11 which should fix crashing on startup. Fixed ‘Too many files open’ errors. Added support for python-geoip for use with libtorrent 1.1. Fixed a single proxy entry being overwritten resulting in no proxy set. Added tracker_status translation to UIs. [GtkUI] Strip whitespace from infohash before checks. Add missed feature autofill infohash entry from clipboard. Backport bind interface option for server. Security: Fixed WebUI CSRF Vulnerability. [Console] Fix decode error comparing non-ascii (str) torrent name. Fixes for splitting magnets from file. Remove duplicate magnet extension when splitting. The new release has been made into the official PPA, available for Ubuntu 12.04, Ubuntu 14.04, Ubuntu 16.04, Ubuntu 16.10, Ubuntu 17.04, Linux Mint 13, 17, 18, and their derivatives.